Often touted for their versatility and transformative qualities, compact utility tractors allow operators to tackle a variety of jobs without investing in multiple pieces of equipment. Through the simple addition of implements — hundreds of which are available for purchase — a compact utility tractor can be used for everything from digging and trenching to grading and moving materials. When looking to purchase implements, it is easy to focus on loaders and backhoes. However, don’t forget to consider one key option: mowing implements. • What type of tractor do you own or want to purchase? • How much horsepower and hitch lift capacity does it have? • Is your tractor compatible with mid-mounted mowers? • What type and how large are the properties you maintain? • What type of grass are you mowing? • What size cutting width makes sense for the job you are tackling? 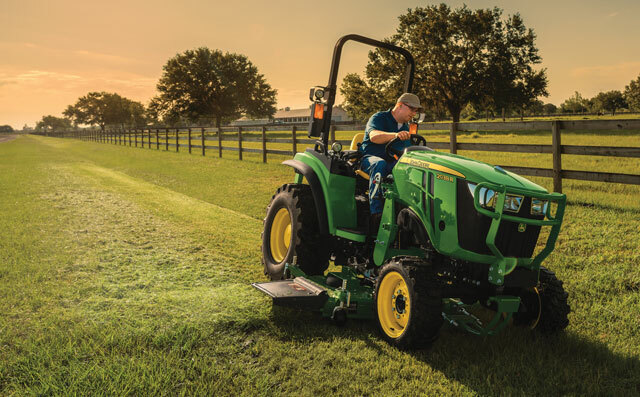 Based on your needs and what type of compact utility tractor you own, there is a mowing implement available that will transform your tractor into a mowing machine. There are two primary mower implement options: mid-mount and rear-mount. Mid-mount mowers, which are attached to the bottom of the compact utility tractor, are ideal for mowing turf and creating a professionally manicured look. Easy-to-use, mid-mount mowers provide a high cut quality, whether the terrain is flat or hilly, and they can be easily maneuvered in smaller areas. An added benefit of mid-mount mowers is that on some models they can be used while other implements like a backhoe or a loader are attached to the tractor at the same time. Additionally, when evaluating your manufacturer’s mid-mount mower offerings, ask about the models that are equipped with technology that can simplify and speed up your job. For example, John Deere offers the exclusive AutoConnect Mowing Deck, which attaches in seconds to save operators time. The deck and drive shaft automatically connect when you drive over it, and when you are done you simply release the latches and back off of the deck to disconnect it from the tractor. 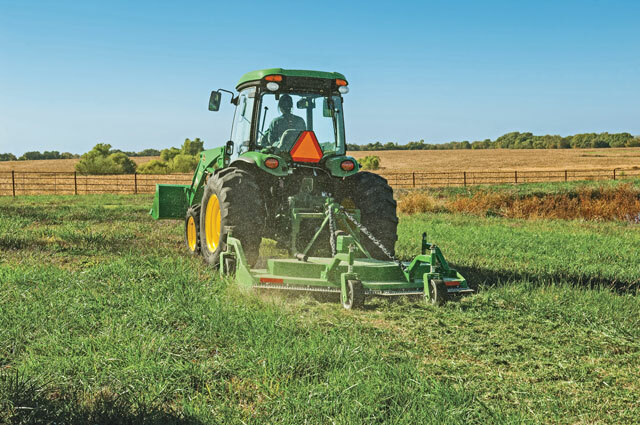 Depending on their size, rear-mount finish mowers are either pulled behind the tractor or are integrally attached to the rear three-point hitch. They are ideal for large, open areas, such as an athletic field. These mowers are usually available with two discharge options. The most common is a side discharge configuration, but you can also get them with a rear discharge setup. This option is appealing to landscape contractors because it eliminates the time spent removing clippings from areas such as sidewalks or flower beds. Rotary cutter mowers are also rear-mounted and ideal for regaining control of overgrown areas with thicker grass, like roadsides or public parks. Unlike mid-mount or rear-mount finishing mowers, rotary cutters are not ideal for creating a manicured lawn, but they are better able to handle tough material like sticks or even small trees. When reviewing your options, your dealer can serve as a resource to ensure you pick the right option for your business. Your dealer will be able to walk through each of the options, identifying the pros and cons of each. Additionally, once you have nailed down which model is best for your business, your dealer will be able to help with the purchasing process. If you are planning to purchase a new compact utility tractor along with your new mowing implement, discuss financing options that package all of your items into one plan. This will give you the most bang for your buck. Once you have identified your new implements and purchased them, it is time to put them to work. When operating your mowing implement, you should always walk around your machine prior to operation, checking for any loose parts or leaks that may require your attention. Double-check the blade height and make sure the mower deck is level. You do not want to mow too low, or you risk hitting your mower blades on the ground, which will potentially cause irreparable damage to your mower deck or bend your mower blades. If you need to install or remove your mowing implement prior to starting a job or after completing a task, reference your owner’s manual as a guide. You should always park your tractor on a firm flat surface to safely remove implements. Much like a traditional lawn mower, compact utility tractor mowing implements require routine service to ensure machine longevity. Your owner’s manual will list key service intervals, as well as the manufacturer recommended oils and greases. You should regularly clean your mower deck — regardless of the type you select — removing any debris and buildup. This will keep your mower deck performing at its best and also protect it from rusting. During the off-season you may want to consider applying a protective coating to the underside of the mower deck to keep it in tip-top shape for the next season. Rear-mount finish mowers are pulled behind the tractor and are ideal for large, open areas, such as an athletic field or farm yards. As you use your machine, be sure to keep an eye on all of the moving parts on your mower deck. Keep the spindles lubricated, keep the gearbox full of oil, keep belts properly tensioned and aligned, make sure all shields are in place and make sure gauge wheels are properly adjusted. Your mower blade, which is pivotal to creating a quality cut, should be regularly inspected and sharpened or changed as needed. Your dealer can assist with sharpening mower blades to ensure you are ready to mow. As mentioned, you should reference your operator’s manual to confirm you are performing the necessary service and follow the service interval schedule. When purchasing your mowing implement, discuss service needs with your dealer. If you are financing, you may be able to wrap in a maintenance and parts program to maximize the value of your purchase. Compact utility tractors are versatile machines that can help you tackle nearly any job you face throughout the week. It is important to work with your dealer prior to purchasing a mowing implement, ensuring that you are getting the best option for your machine and the jobs you will be tackling. Your dealer is a resource that can help simplify the decision-making and purchasing process, answering any questions you may have. By doing your research and working with your dealer, you will be up and mowing in no time. Yanmar America now offers a front hitch kit and matching attachments for the recently introduced model YT235 tractor now in-stock at Yanmar dealers. The front hitch for YT235 tractors allows you to attach a front snow blower, hydraulic-turn snow blade or a rotary broom (available fall 2017). The front hitch has hydraulic lift and a connection to the tractor’s mid-PTO as standard equipment. A hydraulic angle kit for operation of a blade or broom is an option. The front-mounted snow blower on the model YT235 is an ideal solution for the customer that is not satisfied with a rear-mount snow blower. The fron t mounted broom is excellent for snow removal and other landscaper applications. 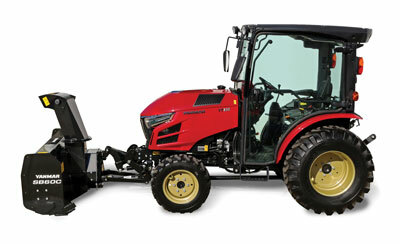 The YT235 tractor comes standard with a mid-PTO, which helps lower the cost of adding front attachments. The YT235 provides 34 hp from a Yanmar diesel engine that meets Tier 4B/Final emission requirements. For more info, visit yanmartractor.com. Jared Lowe is a product marketing manager for compact tractors at John Deere.